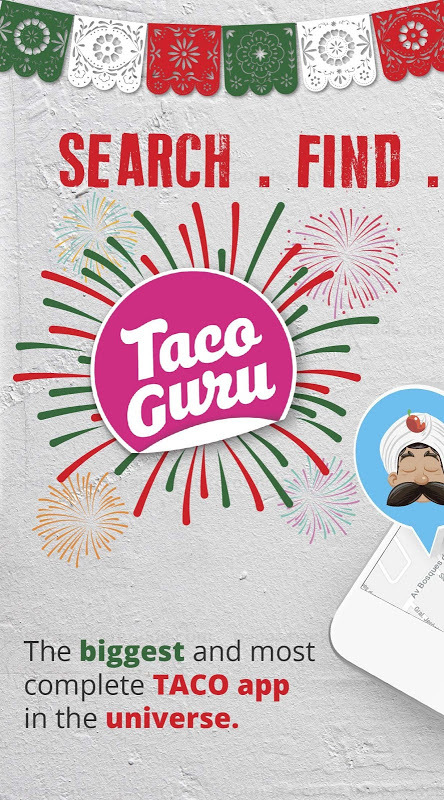 Taco Guru: Find Tacos Anywhere Search and find the best Taco Stands and Restaurants, no matter where you are. Are you craving tacos? With Taco Guru, finding the best ones near you is easier than ever, no matter where you are. - More than 55,000 restaurants, taco shops and taco stands. - Find the right taco for you, using our advanced search filters. - Explore every taco place (being a stand, a restaurant, or a specialty taco shop) near you by using our interactive map. 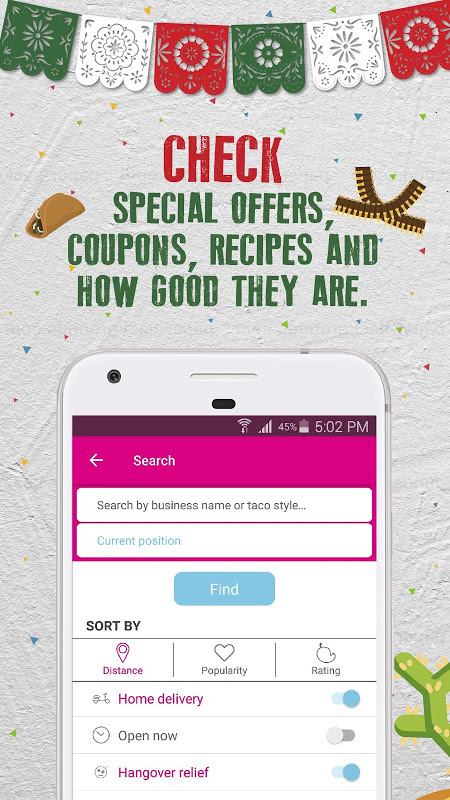 - Get exclusive coupons for your favorite taco places. - Create your own profile and save your favorite taco place. - Write, read and share reviews. - Find the best taco place quickly using our quick sections: Near You, Best Rated and Home Delivery. - Show off your best tacos pictures and see everyone else’s in our Activity section. - Log in with Facebook, Google or your email. Find the perfect taco: - Save your favorite taco places and follow their activity. - Bookmark those restaurants you want to visit so you never miss a good taco eating opportunity. 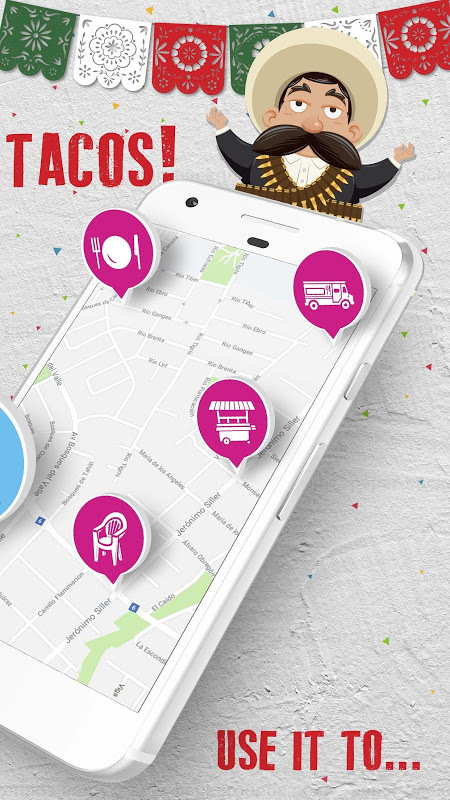 - Check menus, opening hours, addresses, photos, prices and phone numbers of every restaurant and taco stand. - Locate the taco stand you wish to visit on our interactive map and get directions to arrive there. - Find out which are the signature tacos on each place so that you always know what to order. Eat tacos: - Write and read reviews, find out everything you need to know about your favorite taco stand and restaurant. - Upload photos and show off your tacos to thousands of users. - Rate the tacos you ordered and help the entire #Tacommunity choose their tacos. - Earn medals, points and achievements while using the app. - Level up while you use the app. Become a taco authority respected by the whole community: become a Taco Guru. You know that moment when you have a tremendous craving for tacos but not any taco will do? How do you know where to go? Well, go to #LaAppDelTaco, Taco Guru. The world’s largest community of taco lovers that has thousands of photos, tips and reviews that will guide you to taco heaven. Taste aside, there are many other things to consider while trying to fulfill that craving: Where can I go late at night to eat some tacos? What kind of place is it? What are their prices? Can I drink a beer, or do they only have water? How’s the food? Do they have Wi-Fi? Is it pet friendly? We´ve all asked these questions at some point in our lives. 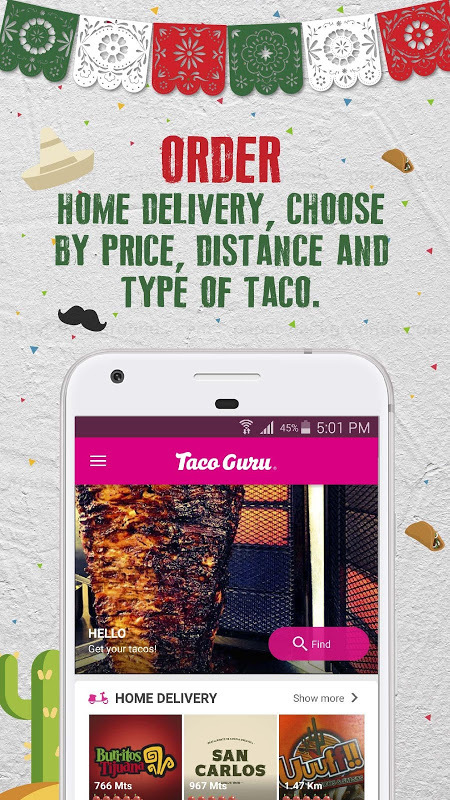 At Taco Guru we realized that there are so many taco choices, and most of them so unknown, that it was necessary to have a real-time, updated taco stand database that’s available any time of day. A taco bible. But, what does Taco Guru do? Simply put, we make life easier. We created Taco Guru so people could speak out and voice their opinions on the most emblematic food in all of Mexico. Which tacos they love and which ones they would never eat again. Whether it's the cart in some dark alleyway or a 5-star restaurant, if they sell tacos, it's in Taco Guru. By seeing a restaurant’s profile, you´ll be able to know what kind of taco place it is, which taco is most liked by our users, which sauce to get, and most important of all, how good (or bad) the food really is. In short, we are the world’s largest taco place directory. We´re putting thousands of establishments within your reach. From northern Mexico´s famous Carne Asada, passing through the center´s traditional Huitlacoche and all the way down to the delicious southern Grasshopper, our app will always give you the best recommendations according to your location. Trust us. We know which tacos you'll like. As simple as: Search. Find. Eat Tacos!  Is Taco Guru: Find Tacos Anywhere yours? Claim it!